I Wonder If… | Food It Yourself! This is a phrase Mr. Food It Yourself uses often. Earlier this week he finished the sentence with “…you can make candy from sweet potatoes.” Since the drought in the North East has rendered the Food It Yourself garden rather seriously boring I decided to pursue this question rather than write about how my fall crops are stunted and bitter. It seems the very definition of a no-brainer. Sweet potatoes are, after all, very sweet. There is no reason not to think a candy could be made from them. In deed, a quick search with my favorite search engine for “sweet potato candy recipe” yielded a large number of results. After weeding out recipes for that hideous marshmallow topped thing people make I found there was a simple formula for sweet potato candy. The main idea was to cook and mash the tubers, add sugar, season to taste, and combine with a starch or flour that did not need to be cooked. 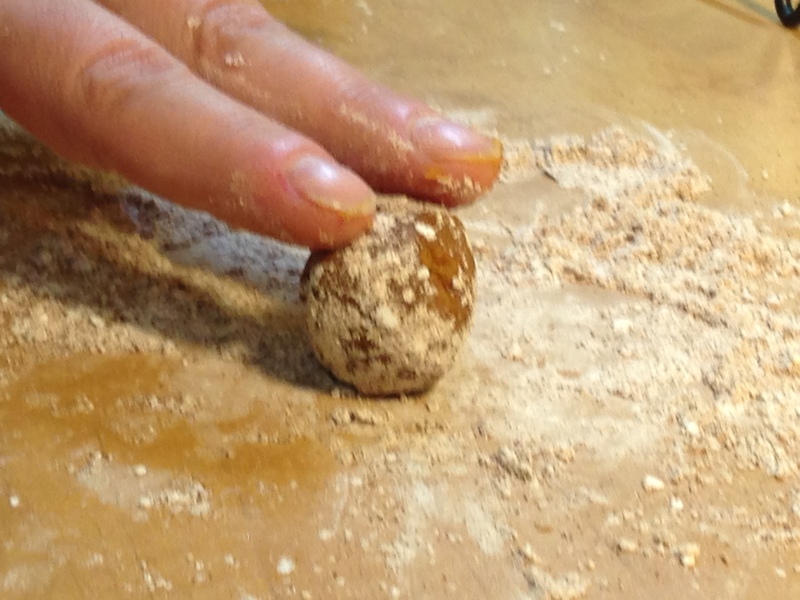 When a moldable consistency is achieved the candy can be molded as desired. 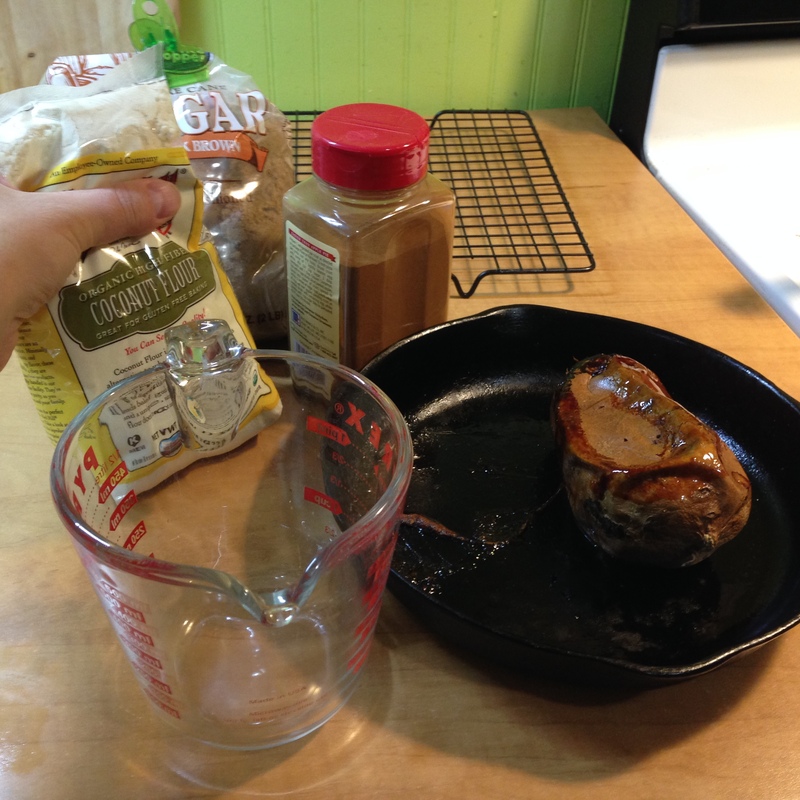 The choice of flour/starch varied between the recipes I found. 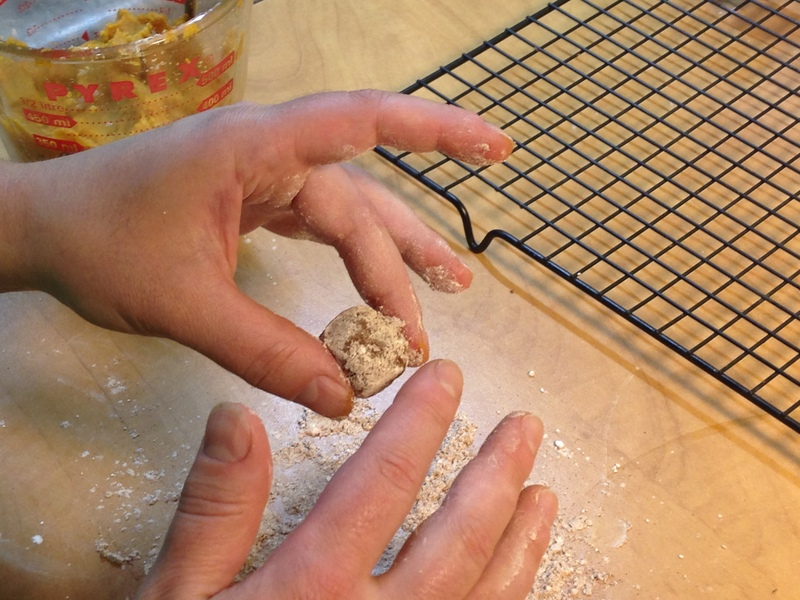 Almond flour, coconut flour, and arrowroot starch were the most common. 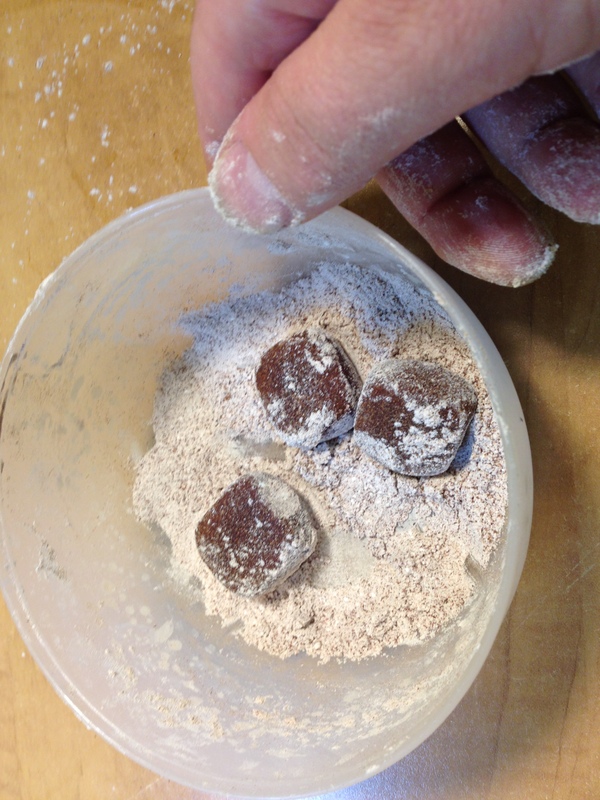 These ingredients do not have a raw starch or raw grain flavor, so the candies made with them would not need additional cooking. I like the taste of coconut, so I chose coconut flour. However, all three were available at my local grocery store in the baking aisle. I found them near the gluten free baking products. One note for those of you who have not played with various types of flour before: do not try this with wheat flour or corn starch unless you really want to know what I mean by “raw starch or raw grain flavor”. That is one large sweet potato, roasted in its skin. Also shown are cinnamon, coconut flour, and brown sugar. 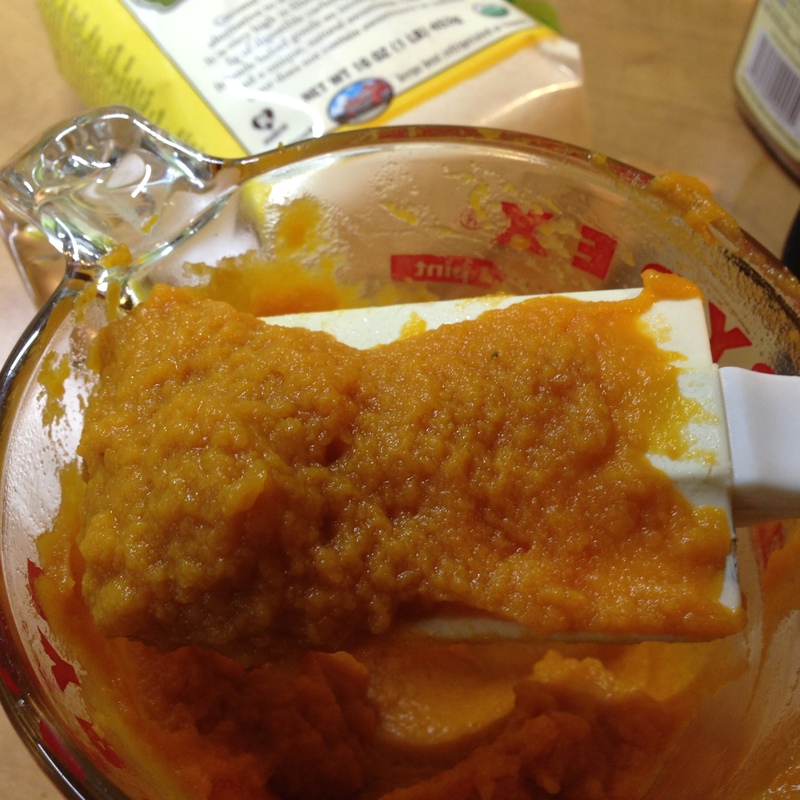 I removed the skin from the sweet potato and hit the baked flesh with my hand blender. A small food processor, stand blender, or a fork and some elbow grease would do the same thing. Really, you just want an evenly textured puree. After mixing in two tablespoons of brown sugar, one half teaspoon each cinnamon and vanilla, and six tablespoons of coconut flour I had a nice, stiff dough. 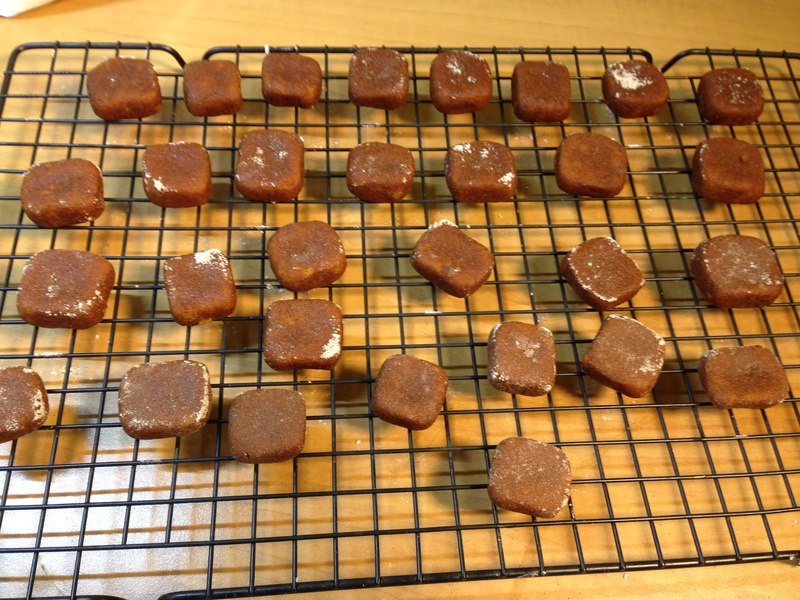 I pinched off little lumps and rolled them in a 2:1 mixture of confectioners’ sugar and cinnamon. Mr. Food It Yourself took this picture of the sugar-cinnamon application. I patted the lumps into little square shapes, but you can go with any shape you prefer. One recipe I found suggested making triangle shapes for a home-made version of candy corn. Here they are, on a baking rack. 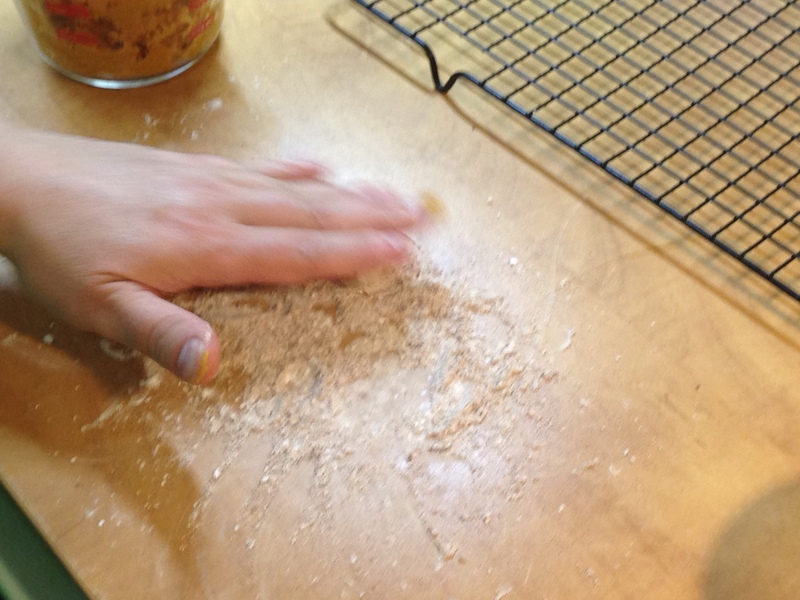 The confectioners’ sugar soaked up some moisture while the candies sat. After a sample, Mr. Food It Yourself and I agreed that the texture was a little too damp. I put the baking rack over a cookie sheet and let the candies sit in a 215F oven for 30 minutes to drive out some moisture. 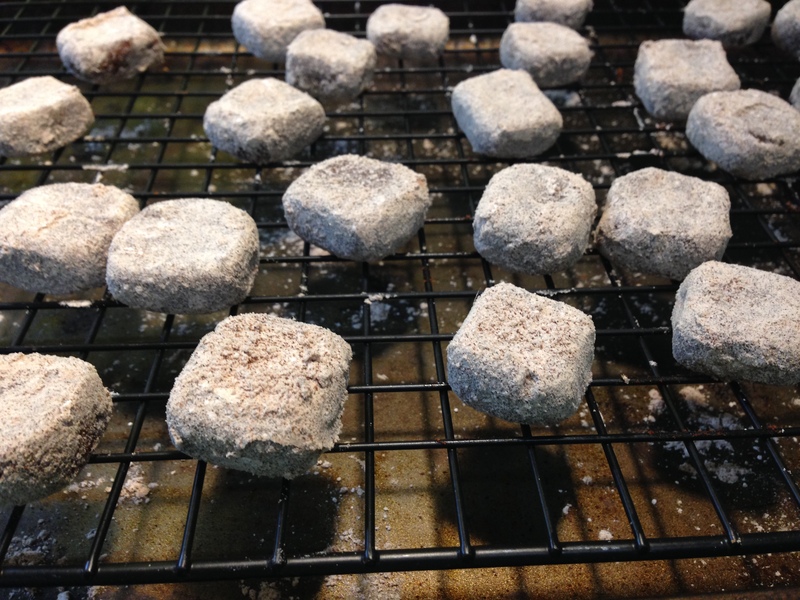 After exiting the oven, the candies got a final dusting of sugar, cinnamon, and (at Mr. Food It Yourself’s suggestion) nutmeg. The final verdict? Mr. Food It Yourself and I both found the candies to be quite delicious. He did suggest that the addition of crushed hazelnuts might be an interesting variation. I do not think the low-temperature baking to remove moisture would have been enough to remove the raw starch flavor from wheat flour or corn starch. If you are brave and want to try to nullify that hypothesis, please let m e know the results. I also noted on the internet several recipes for candy made from mashed white potatoes which were coated in chocolate after forming. This is another avenue that might be worth exploring. I’m going to call this venture an over-all success. We have answered Mr. Food It Yourself’s question with a resounding “YES”. Also, we will enjoy nibbling the resulting sweets all week. What is the best (or worst) answer you have ever found to a food related question? Share in the comments! Behold! A treat fit for any DIYet.